The caddie itself comes with an ironing pad and has four drawers; two of which that can be set up for thread storage or used as regular drawers!  It has a fold out leaf that is perfect to put your serger on! When your not using this caddie you can store it neatly within the cabinet itself. Both Inspiration Cabinet and Caddie can come in White or Teak. Come in and check out our floor model! 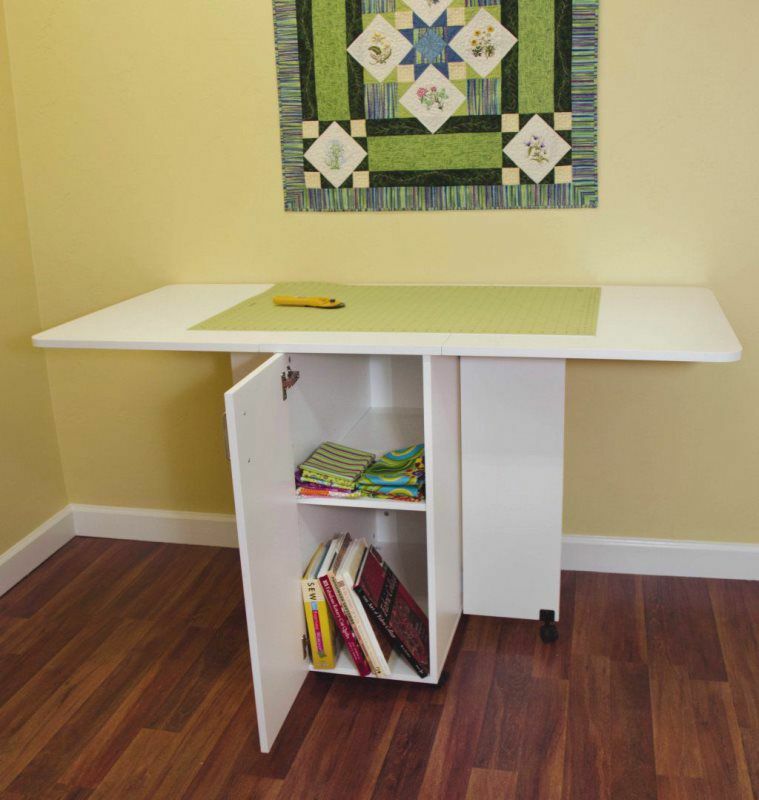 The Imagine Cabinet is a great cabinet that allows for space for both your sewing machine and serger. It has a three position airlift that allows you to have your machine all the way up, flush with the table itself, or all the way down to hide the machine within the cabinet. This also comes with three magnetic strips on one of the doors along with 12 magnetic canisters to allow you to store your smaller notions and acessories. This also comes with a large bin for storage. This comes in both White and Teak. This comes only in white. Come in and check out our floor model! Come on in and check out our floor model yourself! 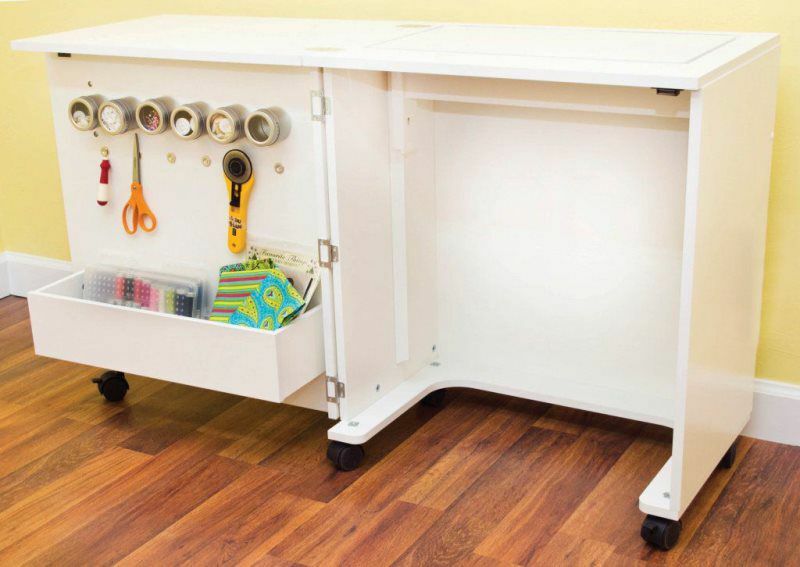 The Create Compact cabinet is great for the sewer that needs a small cabinet that can fold within itself but expand out just enough to have that extra space for those good sized projects! This has a three position airlift that allows you to have your machine up on top, flush with the cabinet itself, or hidden in the cabinet. This also has two magnetic strips on the door that come with six canisters for storage of your notions! This fits machines 19"W x 9 5/8"D. Comes in white or teak. 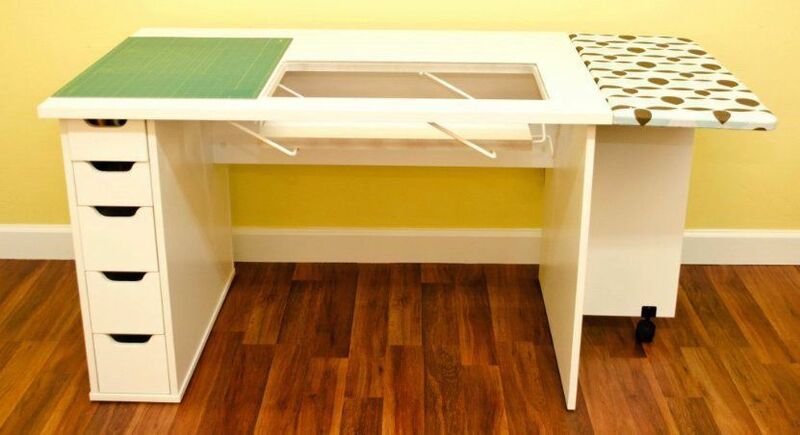 This cutting table is perfect for the sewer or quilter that needs to have a large cutting space when needed and then have the ability to fold it up when not using it. 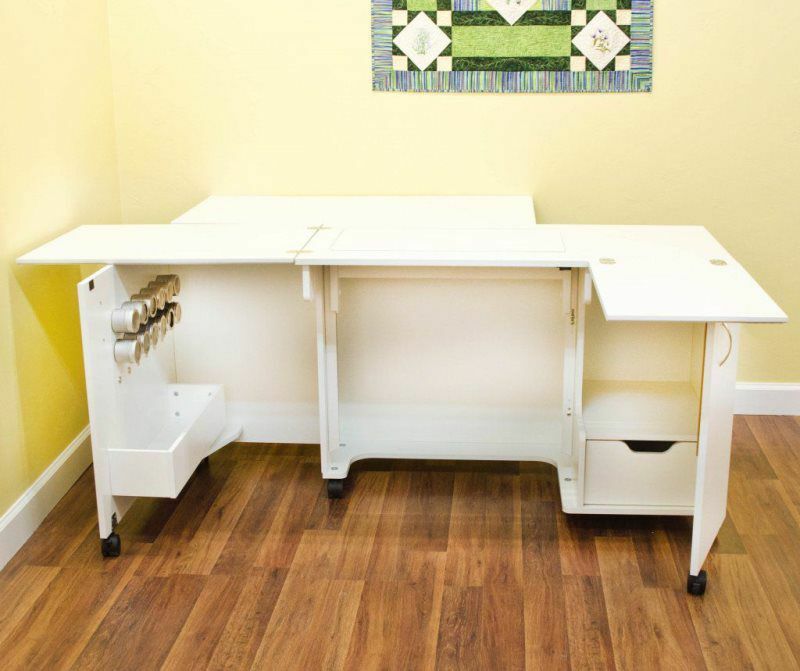 This features a cutting surface of 63"W x 31"D with a height of 34 5/8"H. The door opens up to two shelve spaces perfect for storing your fabric or extra notions! 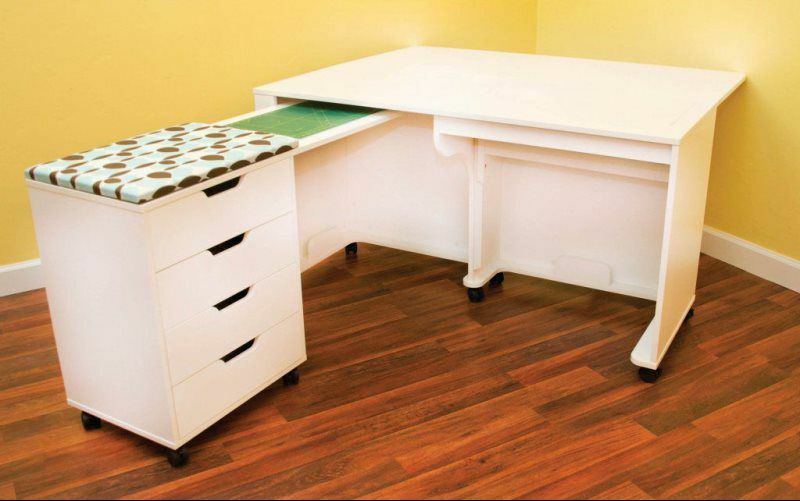 The table folds down into a 17 3/4"W x 31"D x 34 5/8"H. Great for storing away when not in use. It has a set of casters on it for greater mobility. This only comes in white. Come on in and check out the floor model for yourself!